The Nevada State Athletic Commission (NSAC) will be holding an important hearing today (Jan. 29). 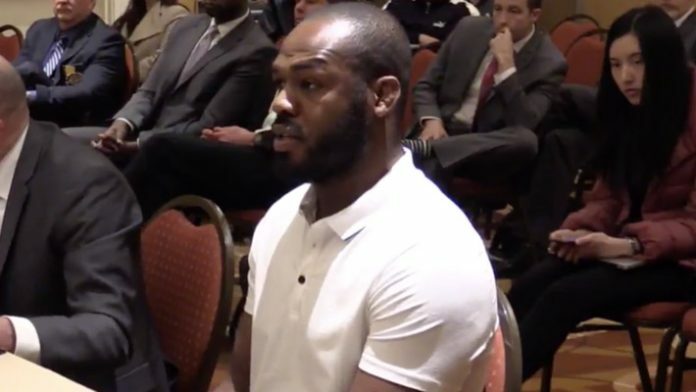 On the docket will be a decision on Jon Jones’ fighting future in the state of Nevada. Jones is attempting to get his license in the state so he can defend his Ultimate Fighting Championship (UFC) light heavyweight gold against Anthony Smith at UFC 235 on March 2. Jones was scheduled to fight in Las Vegas back in December, but a trace amount of turinabol was found in his system. While this was deemed a pulsing effect by the U.S. Anti-Doping Agency (USADA), the NSAC needed more time to assess the situation. There’s also the settlements reportedly entered by UFC lightweight champion Khabib Nurmagomedov and Conor McGregor. Nurmagomedov and McGregor are temporarily suspended due to their involvement in the UFC 229 brawl. McGregor’s teammate Dillon Danis as well as Nurmagomedov’s teammates Abubakar Nurmagomedov and Zubaira Tukhugov are also temporarily suspended. Abubakar and Tukhugov have reportedly entered settlements as well. Nurmagomedov and McGregor will not be attending the hearing. MMA News will post a live stream (courtesy of MMAFightingonSBN) of the meeting, which begins at 12 p.m. ET. Once the stream wraps up, keep it locked on our homepage for the fallout from the NSAC hearing.